It’s EASY to make Giraffe CROSS. 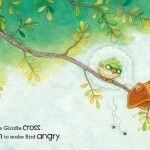 It’s A CINCH to make Bird ANGRY. A comic adventure for preschoolers reveals the history of this squabbling pair. 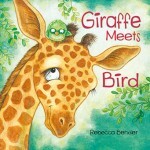 Since 2011 Rebecca Bender’s award-winning Giraffe and Bird books have been tickling the funny bones of children and their families as the cantankerous cronies learn that friendship, while not always easy, is always worthwhile. But how did this unlikely pair become friends in the first place? 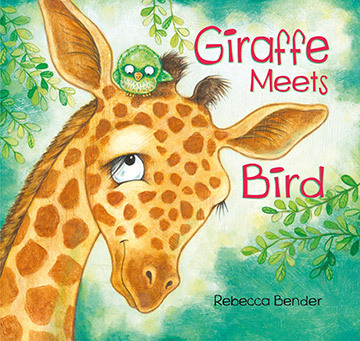 In Giraffe Meets Bird, Bender’s bright acrylics and lively storytelling reveal the friends’ early days while pairs of scrumptious synonyms make her trademark rich vocabulary accessible to a new, younger audience. When the egg in Giraffe’s tree first hatches, he is excited and eager. But the baby bird grows quickly, and he soon learns how to make Giraffe angry and annoyed. It doesn’t take long for Giraffe and Bird to start fighting over their tree. When danger forces them to work together, the two not-quite-friends realize they might not be able to share their home at all. Luckily, they come up with a solution that is surprising, startling, and absolutely stunning.